President Donald Trump's four-nation European tour has allies fretting over the risk of damage he could do to the decades-old NATO alliance. They're also worried about his potential embrace of Russia's Vladimir Putin during a summit in Helsinki. The trip that begins Tuesday in Brussels will also take Mr. Trump to London, where Prime Minister Theresa May's government is in turmoil over her plans for exiting the European Union. Mr. Trump has been pressing NATO countries to fulfill their goal of spending 2 percent of their gross domestic products on defense by 2024. During his presidential campaign, he suggested he might only come to the defense of NATO nations that fulfilled their obligation. He continues to criticize NATO countries for not paying their fair share. "The U.S. is spending many times more than any other country in order to protect them. Not fair to the U.S. taxpayer. On top of that we lose $151 Billion on Trade with the European Union. Charge us big Tariffs (& Barriers)!" Mr. Trump tweeted early Monday. He added, "NATO countries must pay MORE, the United States must pay LESS. Very unfair!" While departing from the White House on Monday, Mr. Trump, however appeared optimistic that a deal would be worked out between the allied nations. "We will work it out and all countries will be happy," he said before boarding Marine One. 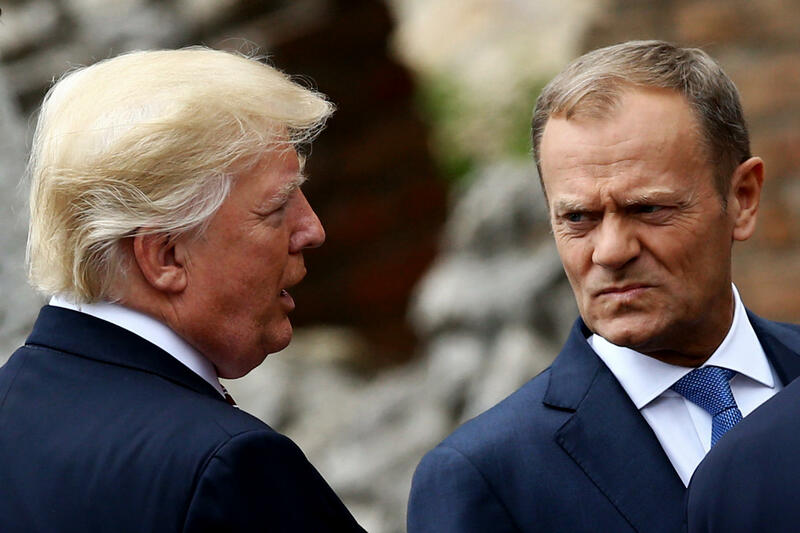 But European Council President Donald Tusk issued a stern warning to Mr. Trump in response: "The U.S. doesn't have and won't have a better ally than EU." "We spend on defense much more than Russia and as much as China. I hope you have no doubt this is an investment in our security, which cannot be said with confidence about Russian & Chinese spending," Tusk pressed, punctuated with a smiley-face emoticon. Tusk made similar remarks after signing a joint EU-NATO declaration in Brussels ahead of the summit, once again warning the U.S. president to "appreciate your allies." "Money is important, but genuine solidarity is even more important," Tusk added. Mr. Trump, who has compared the Brexit vote to leave the EU to his own election, will be making his maiden presidential trip to Britain at a fraught time for May. Foreign Secretary Boris Johnson and Brexit Secretary David Davis resigned within hours of each other in protest of her plan. Mr. Trump's visit is expected to attract large protests in London and elsewhere in Britain. Mr. Trump's weeklong trip to Europe will continue with a stop in Scotland before ending with a sit-down in Helsinki with Putin, whose country the U.S. intelligence community has concluded interfered in the 2016 election to help Mr. Trump win. While departing on Monday, Mr. Trump said his meeting with the Russian leader "may be the easiest" of all his meetings this week in Europe. "Who would think?," he remarked. The meeting will be closely watched to see whether Mr. Trump will rebuke or embrace Putin, who has repeatedly denied the allegations of election meddling, in spite of evidence to the contrary. Asked if Putin should be seen as a friend or a foe to the United States ahead of their summit, Mr. Trump told reporters "I really can't say right now; as far as I can say, a competitor. " He added, "Getting along with Russia, getting along with China, getting along with others is a good thing not a bad thing, so we'll see, we're meeting with Putin on Monday well see how that goes."